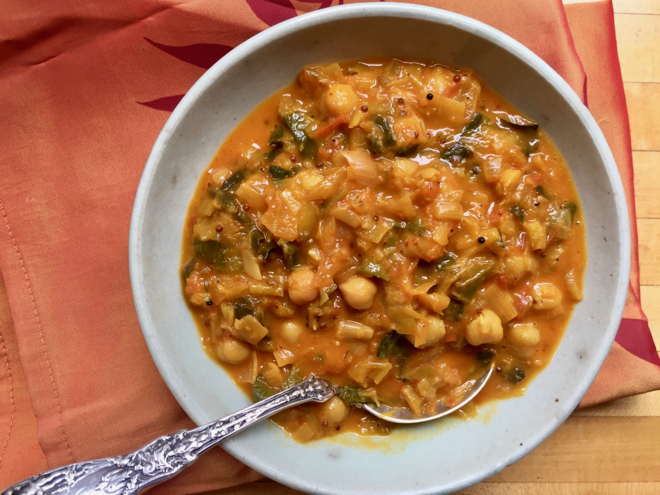 This is a fairly quick, flavorful curry and you can use whatever leafy greens you have (feel free to increase the quantity of greens). I needed to use up some leeks when I made the above version which adds sweetness. Adding the fresh, mashed garlic at the very end adds a nice dimension. Heat the oil in a large pot or dutch oven over medium-high heat. As soon as it’s shimmering add the cumin and mustard seeds and cook for a few seconds–be careful not to burn. Add the onions, chard stems and leek, if using, stir well and cook for 5 minutes, until softened. Add the ginger, turmeric and hot pepper and stir well. Fry for another 3-4 minutes until fragrant and a shade darker. Add the tomatoes, chickpeas, coconut milk and 1/2 cup water, salt, pepper and bring to a simmer. Cook for 15 minutes, partially covered, then add the chard and cook for another 5 minutes until tender. Stir in the minced garlic and lemon juice. Taste and adjust seasoning with salt, lemon, hot pepper, etc. Serve hot over rice.